Being the height lovers that we are, we wouldn't miss going up the Calgary Tower during our visit to Alberta. There's something about seeing a city from above that appeals to us. I think we've gone up every tower or every high point of every city that we've ever visited. It's a must on our list of things to do. You see it in many cities around the world. You know, that one tower or skyscraper where you can go high above every other building to look down at the cityscape? There's the Eiffel Tower in Paris, the Petronas Towers in Kuala Lumpur and Toronto's CN Tower. Well, Calgary, Alberta has a tower too! After a delicious lunch at Charcut located just around the corner, we were initially going to take a walk around the city to explore. But being so close to the tower, we decided to go inside and get our bearings. I find seeing the city from above gives you a better sense of direction and scope. It's also fun to walk around the observation deck. 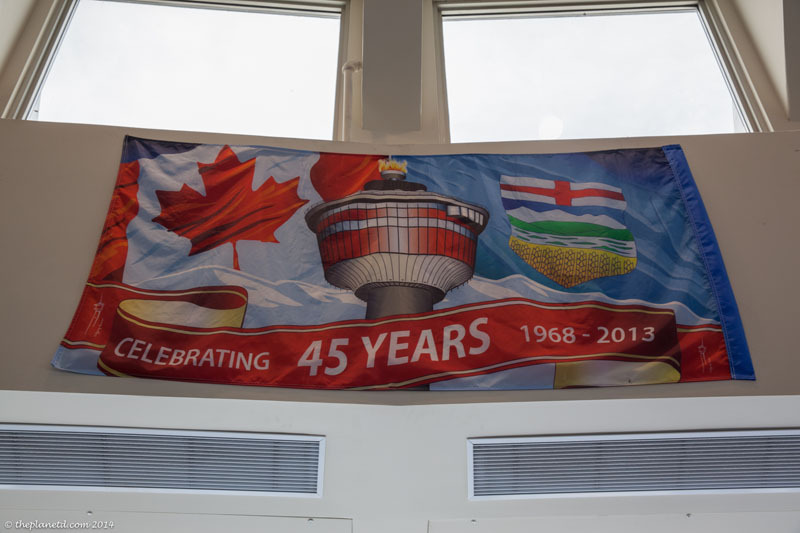 It's interesting to note that the Calgary Tower has been around since 1968. It's one of the first towers of its kind. The CN Tower wasn't built until 1976, The Oriental Pearl in Shanghai wasn't until 1994 and the KL Tower of Malaysia wasn't built until 1995. (And yes, we've been up all of those as well) It wasn't until recently that every city it seemed started to build high towers. While the Calgary Tower isn't one of the highest of the bunch, it does own the title of having the highest observation deck in the world thanks to being 1228 metres above sea level. It pays to be located in a city that is 1000 metres above sea level! I find that you can never truly get a sense of a place until you see it from above. When you are walking around on the ground, it's difficult to see the size and scope of a city. Getting above the buildings and noise helps you appreciate the beauty of the setting and the city itself. 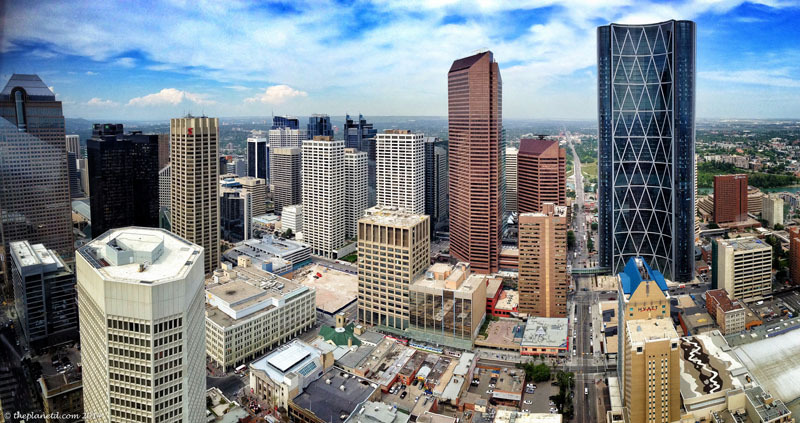 The observation deck of the Calgary Tower offers a beautiful panoramic view of The Rocky Mountains, the Prairies and the foothills that surround the city. I was most excited about seeing the famous Calgary Stampede grounds from above. You must try standing on the glass floor. If you are afraid of heights, this is the perfect chance for you to try to conquer your fear! Standing high above the street staring down feels as if you are standing on air. It's so much fun to give it a try. The energy of everyone picks up when they see the glass floor and people laugh and test their nerves and bravery. It's perfectly safe. The glass floor is 36 feet long and more than four feet wide. A fun piece of trivia: The glass panes that make up the floor can each hold the weight of a couple of Hippos! Visiting Calgary was a joy for Dave and I. We'd been to cities around the world, but it took years for us to discover the province where I was born. We've seen so many bits and pieces of Calgary in our lives. Each year we watch the Calgary Stampede on TV, my parents still talk fondly of the city, and we still have memories of the Calgary Olympics. 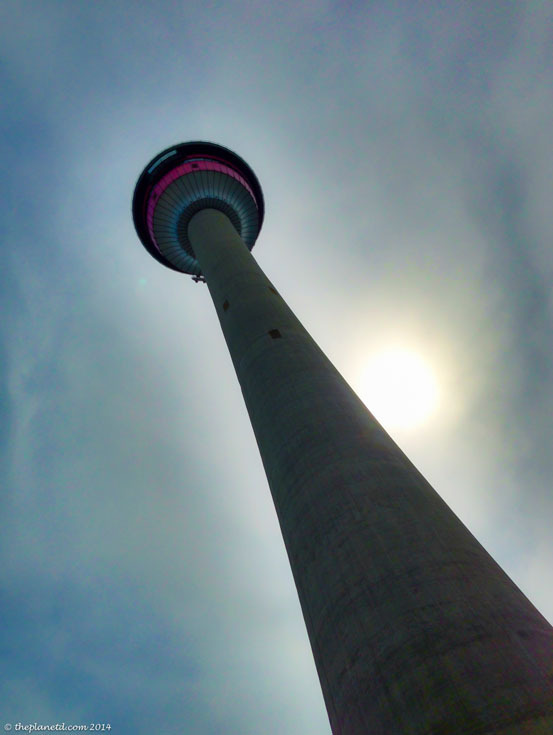 The Olympic Torch still sits at the top of the Calgary Tower and is still lit for special occasions like Canada Day. Visiting Calgary in offers a ton of activities and places to see. 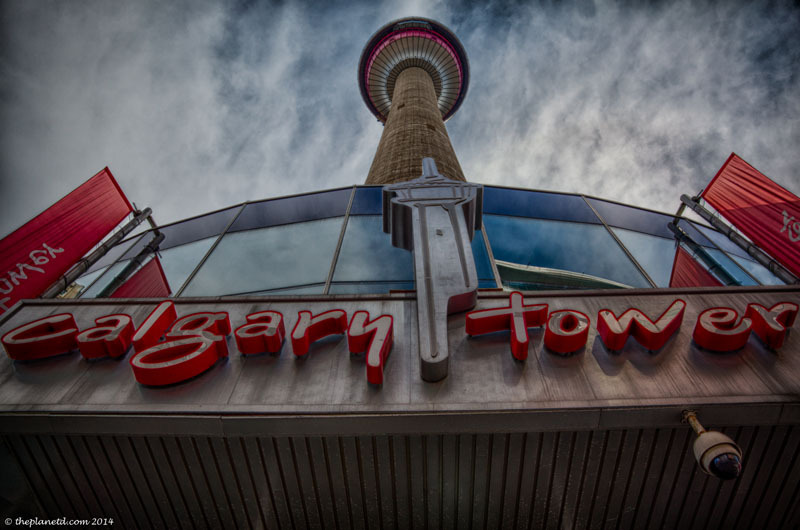 With parks and festivals, The TELUS Spark Science Centre and the Calgary Zoo, there's a lot to see and do, and you can start planning your route from the top of the Calgary Tower where you can see all the attractions from above! For more information on visiting Calgary, go to the Tourism Calgary Website. 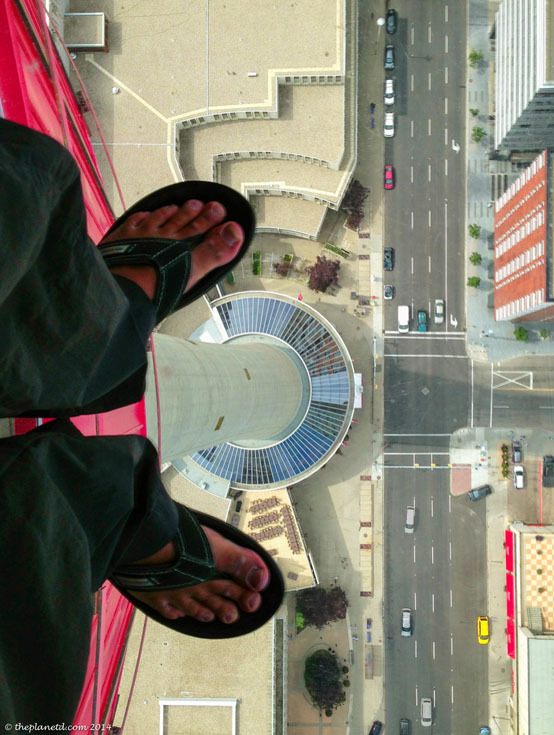 9 Responses to "The Calgary Tower – The World’s at Our Feet in Western Canada"
I would be afraid to go on that glass surface.It’s scary. These tall towers are among my favourites… I tend to hunt down the observatories and high spots for admiring city skylines – every time I travel. The Calgary Tower looks slightly similar to the CN Tower in Toronto. Fantastic photos of a great city. We spent close to year in Calgary and it’s great to that it’s finally getting the attention it deserves. Will you guys be making it to the Stampede next year?! It’s a must! Wow what a post my dear Calgary tower makes view scene But your explaining way and pictures make this perfect so . You make my day ..